In 1985, Faith For Today launched Christian Lifestyle Magazine, a program that set new standards in religious programming. CLM followed a news-feature format and was hosted by Dan Matthews and Suzanne Austin (later, Lena Nozizwe). Television audiences saw powerful stories of Christians who have made a positive influence in their communities and in their world. The show broke down barriers and helped viewers overcome their prejudice towards Christianity. Christian Lifestyle Magazine paved the way for Lifestyle Magazine, launched five years later. 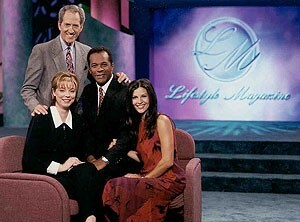 The 1990 Lifestyle Magazine team included Dan Matthews, Clifton Davis, Tami McGrew and Patty Cabrera. The show, which took on a talk-show format, centered around timely health issues and also addressed people’s physical and emotional needs. Powerful topics include forgiveness, overcoming addictions and the power of prayer. In 2004, Mike Tucker became the new speaker/director of Faith For Today. Hailed from Texas, where he was senior pastor of a 2,000 member Seventh-day Adventist Church, Pastor Tucker has a rich background in pastoral ministry, counseling, chaplaincy and evangelism. He and his wife, Gayle, made Faith For Today relevant and accessible to local congregations through innovative programming and live seminars. 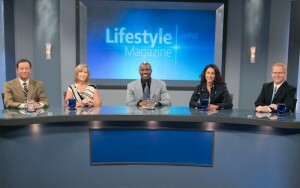 In 2007, Lifestyle Magazine received a new look when Mike and Gayle Tucker became the hosts of this dynamic and enduring program. The show focused primarily on relationships, spirituality and health – topics that have proven to be of greatest interest to long-time viewers. After several consecutive years of award-winning programming, the focus of the show has shifted for the 2014-2015 season to a whole life health approach, along with the addition of three new co-hosts who join Mike & Gayle Tucker. Dr. Sharmini Long is an Internal Medicine specialist, Endocrinologist and expert in Obesity and Diabetes treatment. Fitness and nutrition expert Obi Obadike has been featured on over 30 top fitness magazine covers in 2015 was recognized as the #1 influencer in the world for fitness and health on Twitter by Onalytica and was ranked in 2014 as one of the Top Ten most influential fitness experts by Dr. Oz’s ShareCare.com. Lynell LaMountain is the CEO of Life Ignited, a personal development company that helps individuals focus on things that are within their control to change – choices, outlook and health – to develop a more complete and balanced lifestyle. The goal of the show is to bring quality informative about elements that affect people’s lives on a daily basis so they can achieve a more balanced and healthy lifestyle that works for them individually. Lifestyle Magazine continues to evolve with the times to meet the changing needs of our audience and continue to bring top quality programming to millions of people each week around the world.